THE MAKER’S STAMP ‘H. 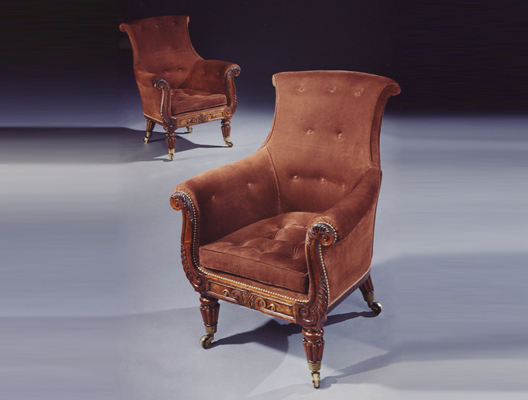 H.’ The very strong probability on design grounds that this pair of chairs emanated from the GILLOW manufactory at Lancaster, would facilitate the search into ascertaining the owner of the stamp H.H. 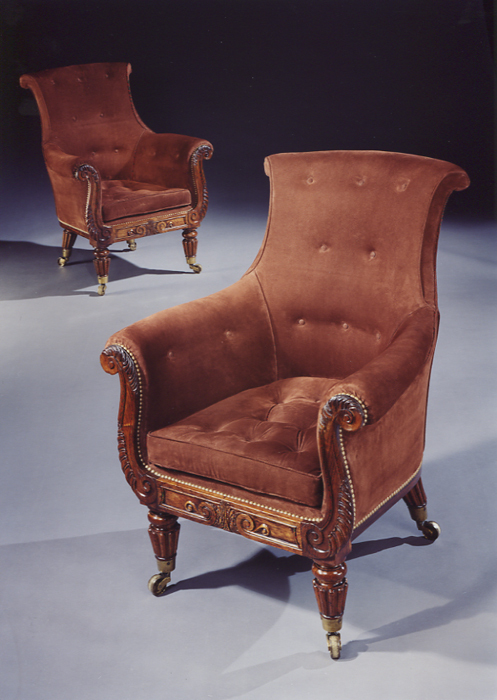 In the Dictionary Of English Furniture Makers 1660-1840 edited by Geoffrey Beard and Christopher Gilbert, the following insert is made on page 445; ‘Holmes, Henry, Lancaster. Named in the Gillow records, 1805-1834. (Westminster Reference Library. 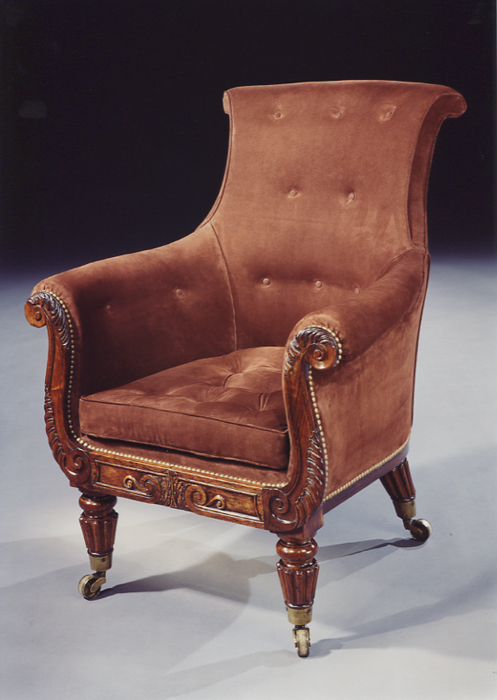 )’ Given that these dates would seem to tie in with the design of the chairs, it is therefore most likely that Henry Holmes was their maker. 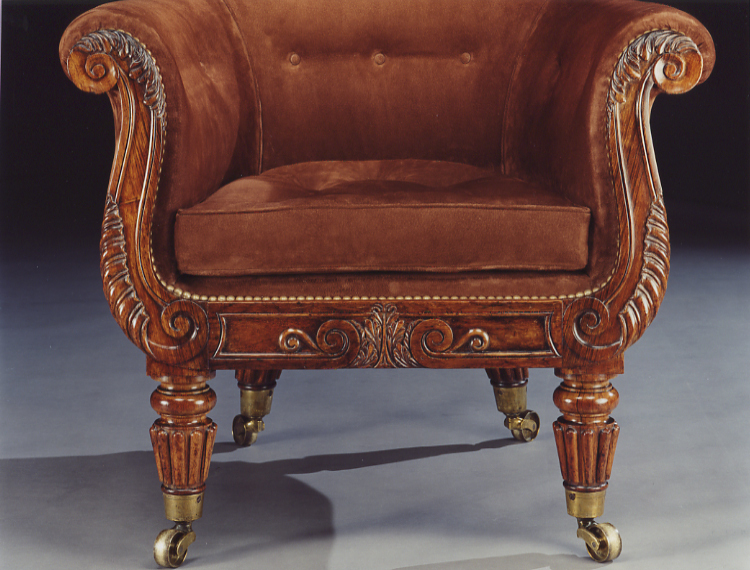 The principle styles of Design in Furniture, as at present executed in Britain, maybe reduced to four; viz., the Grecian or modern style, which is by far the most prevalent; the Gothic or perpendicular, which imitates the lines and angles of the Tudor Gothic architecture; the Elizabethan style, which combines the Gothic with the Roman or Italian manner; and the style of the age of Louis XIV, or the florid Italian, which is characterised by curved lines and excess of curvilinear ornaments. The first or modern style is by far the most general . . . Height (of backs): 39 3/4in (101cm). Height (of seats): 17in (43cm). Depth (of seats): 21 5/5in (55cm). Overall width 31 1/8in (79cm).